The warm-up area contains six large four-foot high red buoys marking the centerline of the river. Crews should always stay to the right heading either downstream (south) or upstream (north), keeping the buoys on their port side. Don’t cross over between the buoys – always go to the end before turning. 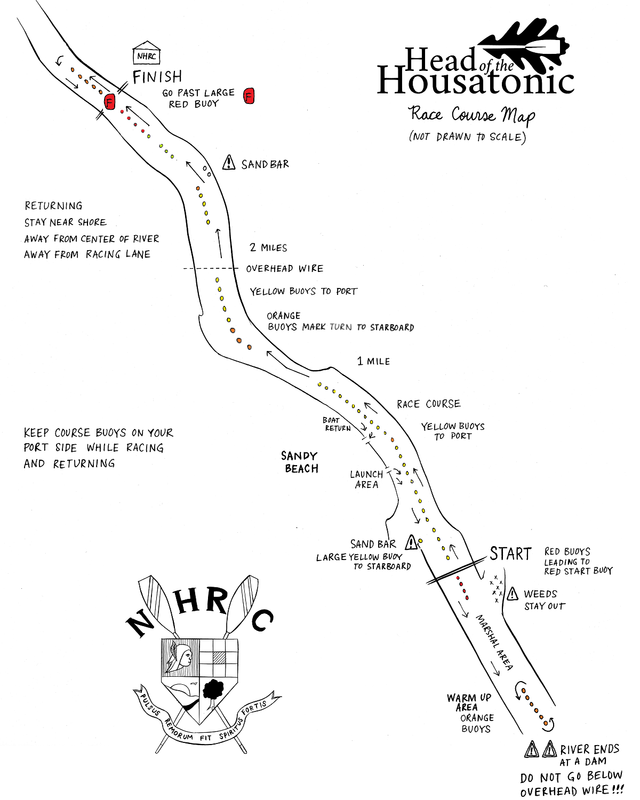 The starting chute is marked by 20 red buoys and one large, four-foot buoy right at the start. After the start, there will be a series of straight lines of small yellow buoys marking the edge of the course. Each segment will be about 500 meters long. When turns occur, they will be marked by a large orange buoy. Always keep the buoy line on your port side. At the turn before the wire (about 1.2 miles to go), there will be a series of large orange buoys marking the center of the river, which is narrower at this point. Ensure that you keep to the right, both during the race and while returning. The last 1000 meters is straight. The buoys in the last 500 meters will all be red, so you will know when you are close to the end! The finish will be marked by a large, four-foot high red buoy. Be sure to stay to the right of that buoy to ensure that your bow number are correctly read. After you finish, be sure to keep rowing until you are clear of the finish-line area. There will be several large yellow buoys at several points along the course, warning of various hazards, such as sand bars or downed trees. Keep those buoys on your starboard side. Competitors at Indian Well State Park launch from the sandy beach by walking boats into the water. The water temperature is comfortable and the bottom is sandy. There is no dock. 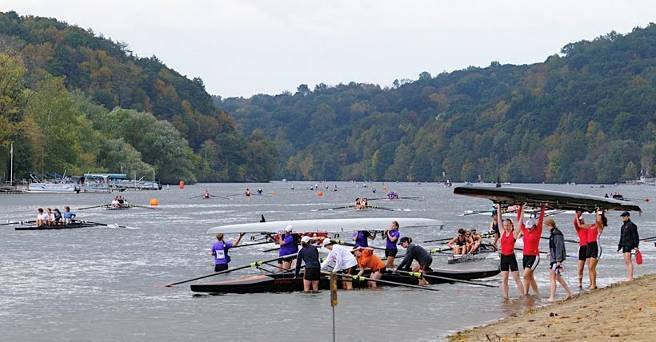 Once the hull is in the water crews will be allowed a short loading time to put rowers, coxswains and oars in place and then get away from the beach AS SOON AS POSSIBLE. Crews are expected to row 10-20 strokes and then tie in and get settled. Bring a laundry basket or other container to collect all shoes. Take them back to the trailer; do not store them on the beach. Please inform everyone on your team (and all parents) that the beach must be kept clear to make launching as efficient as possible. We appreciate their help in keeping the beach clear of extra people and shoes!